Diet is a cornerstone of long-term health and vitality. It provides the nutrients needed to support the body’s many physiological processes, including tissue repair, cognitive function, and immunity, among many others. For elderly parents, maintaining a healthy diet can be a challenge. A lack of assistance causes many elderly people to miss meals or eat foods that are inadequate for their nutritional needs. These and other factors lead to malnutrition and secondary health issues. 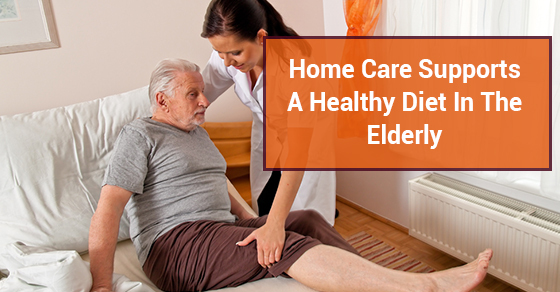 But knowing how home care services help elderly parents maintain a healthy diet lets you make the right choices for your loved ones and support their health. The quality of an individual’s diet supports disease prevention and management. A healthy diet can also reduce the need for certain medications or supplements. But there are also many issues that are specific to elderly patients. In many cases, parents may have limited mobility or function. This can prevent them from preparing meals or feeding themselves on a regular basis. Parents who suffer from cognitive issues such as dementia or Alzheimer’s may struggle with maintaining a healthy diet. Emotional issues such as depression can interfere with their daily personal care as well. Medical conditions such as diabetes may require specific nutritional regimens that can be difficult to follow without the proper guidance and motivation. Home care services help patients understand nutritional guidelines given to them by their doctors and ensure that all of their needs are being met. Long-term health requires motivation. Having the right support system in place ensures that elderly parents adhere to their diet and exercise programs. Home care addresses a wide range of needs while keeping individuals on track to improve their health and overcome illness through a healthy diet. A home care provider can help patients with their grocery shopping and meal preparation. Making the recommended dietary changes and implementing them on a consistent basis leads to lasting health benefits. Some elderly parents may require fewer calories due to health issues or low levels of physical activity. This can interfere with their ability to obtain the nutrients they need for long-term wellness. By choosing nutrient-dense foods, patients can maintain their health even when their calorie intake is reduced. Choosing the right foods is key, and home care services help patients select the foods that give them the greatest nutritional benefit. Nutrient-dense foods include high-quality fruits, dairy products, green leafy vegetables, and protein sources. These provide vitamins and minerals that are essential to meet the body’s daily metabolic needs while supporting the healing process. Home care services provide a wide range of benefits for elderly parents. Most importantly, they ensure that individuals maintain a healthy diet and meet their daily nutritional needs. Over time, this establishes long-term wellness and disease prevention.